Aladin wurde mit Mama Ashley und seinen Geschwistern, Aisha, Fanny, Anni und Frederik von unserem Fahrer Bogdan in der Nähe gefunden und natürlich konnte er sie nicht einfach dort lassen. Mama Ashley ist eine freundliche Hündin, die sich liebevoll um ihre Kinder kümmert. Sobald Aladin und seine Geschwister alt genug sind, dürfen sie hoffentlich zu lieben Menschen ausreisen. Aladin was found with mama Ashley and his siblings, Aisha, Fanny, Anni and Frederik nearby by our driver Bogdan and of course he couldn't just leave them there. 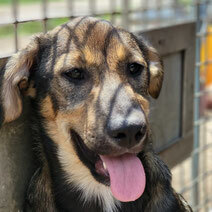 Mama Ashley is a friendly female dog who cares lovingly for her children. As soon as Aladin and his siblings are old enough, they will hopefully be allowed to travel to loving people.